During the Q&A for Favor the Bold, Brad made the comment that he'd "like to see dilemmas with skills in their requirements played a bit more." Whenever Brad makes comments like that, the next question that needs to be asked is: "Will it be a carrot or a stick?" Well, it appears to be a stick. If you want to play with lots of dilemmas that do not require a skill, then Helen may hit you on the head. Helen showcases the flipside of the personnel coin in Favor the Bold. The front side are personnel like Neral, who help you avoid the effects of popular dilemmas like An Issue of Trust. The flipside are personnel like Helen who get proactive and help you avoid facing popular dilemmas altogether. Play Helen at cost +3 and start getting rid of popular dilemmas like Chula: The Chandra, The Caretaker's "Guests", The Dreamer and the Dream, etc. If it costs more than zero and doesn't require a skill, you can knock it right out. Kirk may have hit on her at the party, but it's Spock (Science Officer) who she pairs best with. On successive turns, you could look at the top eight dilemmas of an opponent's dilemma pile and remove two or more of them. That's one mission attempt worth of intelligence on what your opponent is playing, and to top it all off, you could end up getting rid of several dilemmas you don't want to face. While Helen may showcase part of the overarching theme of Favor the Bold, each of the personnel who acts to affect dilemmas does so in his or her own unique way...and like Helen, with the particular spice of his or her particular affiliation. Neral is all Romulan, protecting Treachery personnnel. Helen is all Original Series with her upgrade. A certain Ferengi I will be writing about in the near future is all Ferengi, though his peers may disagree. Like all Original Series people, it's important to discuss their worth even if you don't use their upgrade. 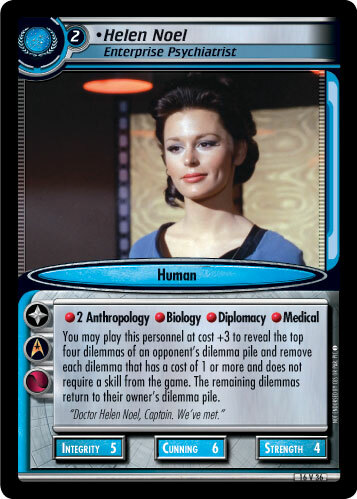 At cost two, she provides four skills, including a double dose of Anthropology to help her uncover some Antedean Assassins, Diplomacy to communicate with Gomtuu, and a Biology/Medical combination to fight a Tsiolkovsky Infection...though don't expect her 5-6-4 attributes to be much help.